Planning & Development | South Rosedale Residents' Assoc | The SRRA is one of Canada’s oldest ratepayer groups. Formally incorporated in 1931, the Association is committed to providing South Rosedale’s residents with a strong voice relative to the area’s unique position as one of Toronto’s most desirable residential communities. If you are contemplating making changes in property that are the subject of any City by-laws, The South Rosedale Ratepayers’ Association may be able to advise you on the process once you have developed a concept and a preliminary design. To contact the Director responsible for this initiative, use our contact form. On November 17, 2016 the South Rosedale Residents’ Association (SRRA) held its Annual General Meeting at the Toronto Lawn Tennis Club. There was an unusually large crowd in attendance, many of whom were supporters of the MyRosedaleNeighbourhood petition opposing the proposed Dale Avenue development, the details of which were filed with the City of Toronto for consideration in August 2016. The AGM was also attended by Councillor Kristyn Wong-Tam and members of her staff, who stayed a full two hours and answered residents’ questions and explained some of the City processes regarding the Dale Avenue development proposal. Representatives of the developer also attended the AGM. The Dale Avenue proposal was the focal point of the evening and generated extensive and at times heated discussion during which many members of the South Rosedale community expressed their concerns and opposition to the project in no uncertain terms. Numerous questions were fielded by SRRA directors, who pledged that the SRRA would be at the forefront of a thorough planning process in which community concerns, questions and issues would be fully aired and considered. This process includes organizing special SRRA members’ meetings on the development proposal, the upcoming November 22 community meeting organized by the City of Toronto, the possibility of City-sponsored working group meetings between now and the Fall of 2017, and a charrette process discussed informally at a recent meeting between representatives of the SRRA, MyRosedaleNeighborhood and the developer. During the AGM, questions were asked about a letter written in July 2016 by the SRRA Heritage Subcommittee to City Heritage Preservation Services (HPS). This letter was written in response to a normal course request from HPS for comment on certain heritage issues. In keeping with prior longstanding practice, the Subcommittee communicated directly and independently with HPS. (The Board intends to reconsider this practice as it relates to any current and future planned multi-unit development projects). Contrary to rumours apparently circulating in the community, this letter did not express general support for the development proposal but rather focused specifically on heritage issues, as opposed to the broader planning issues (e.g. height, density and trees) raised by the redevelopment of the Dale Avenue site. Subsequent to the Subcommittee’s July heritage letter, the developer acknowledged that the SRRA had not issued a letter of support for the development proposal (further details below). The SRRA recognizes that certain issues addressed in the July heritage letter need to be reconsidered and addressed by the SRRA Board based on input from a heritage expert. The July heritage letter is set out below. Subsequently, in early August, the developer submitted a formal redevelopment application to the City for a 4-storey residential building with 26 dwelling units, together with a large number of studies and reports prepared by the developer to support its proposal. Since that time an increasing number of South Rosedale residents have expressed serious concerns regarding the proposed development, and as noted above, community members expressed their concerns forcefully at the AGM. Over the past two months, as opposition to the Dale development has grown, the SRRA Board has devoted many hours of time and has held numerous internal discussions regarding the proposal, including in relation to all of the issues referred to above. As a result, on November 10, 2016 the SRRA issued a Statement of Principles regarding the proposal, approved by resolution of the Board. In this Statement of Principles the SRRA reiterated that it “has not supported, and does not support, the proposed Development in its current form.” This was emphasized on several occasions during the recent AGM. The entire SRRA Board and a Board Subcommittee that is focused exclusively on the Dale development proposal are now considering all aspects of the proposal, including heritage issues. As stated at the AGM, the SRRA intends to retain professional services as may be required in connection with the proposed development, including the services of a heritage expert to assist the Board in determining its position on heritage issues. All relevant issues, including heritage, will be addressed by the SRRA Board. Several members of the SRRA Board will be attending an informal follow-up meeting about Dale Avenue with Councillor Wong-Tam on Monday and will also be attending the community meeting at St. Simon-the-Apostle Church on Tuesday evening (7-9 PM). As promised at the AGM, the SRRA looks forward to seeing interested community members at the Tuesday meeting and to working together over the next 10-12 months to respond responsibly and thoroughly to the South Rosedale community’s issues and concerns about this project. Above all, the SRRA is highly committed to achieving an outcome that meets the needs and wishes of the South Rosedale community. Confirmation that the proposed Official Plan Amendment is appropriate and maintains the intent of the Natural Environment policies. Furthermore, the City noted that additional issues may be identified through the review of the Development application, agency comments and the community consultation process. The proposed Development and the above issues have generated significant concerns and interest within the South Rosedale Community. The South Rosedale Residents’ Association (“SRRA”) Board of Directors shares many of the concerns expressed by the City Planning Division and the Community. There are many outstanding issues that require further review and resolution. Accordingly, the SRRA has not supported, and does not support, the proposed Development in its current form. 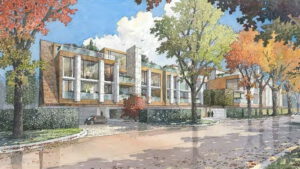 In addition, the SRRA intends to do everything possible — whatever form the proposed Development may ultimately take — to ensure that appropriate protections are in place to avoid any implication that redevelopment of this unique site sets any kind of general precedent for South Rosedale or the surrounding residential areas. The SRRA Board has established an internal subcommittee to focus on the proposed Development. The Board, and specifically the subcommittee, has and continues to obtain feedback from the Community and conduct due diligence regarding the key issues, and will obtain appropriate professional advice as required. The SRRA intends to actively participate in the planning process for the Development, prior to the final City Planning Report, which the City has indicated it will issue in late 2017. This approach is consistent with the leadership role the SRRA has taken historically on both major and minor development matters within and on the borders of South Rosedale, as well as the initiation of the process and the commissioning of the Heritage Study which resulted in the designation of South Rosedale as a Heritage Conservation District. 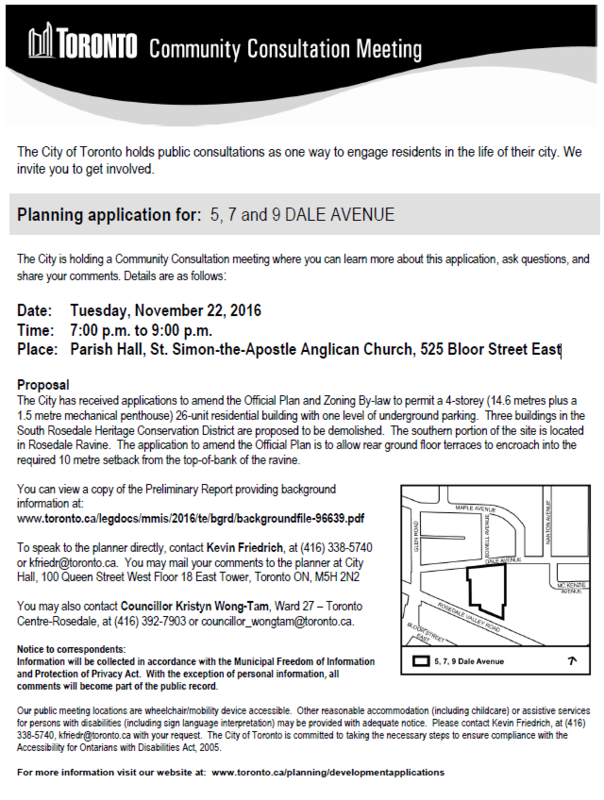 The next formal step in the planning process is a Community Consultation Meeting scheduled for 7:00 PM on November 22, 2016 at St. Simon-the-Apostle Church, 525 Bloor Street East. This is an important meeting and the SRRA encourages all interested South Rosedale residents to attend. The SRRA expects that this public meeting will be the start of a robust consultation process over the next year, and will actively advocate for such a process. The SRRA hopes that this process will lead to a reasonable outcome that meets the needs and wishes of the South Rosedale Community and all concerned parties, and that it will avoid the need for a potentially protracted and costly Ontario Municipal Board hearing regarding the Development. The SRRA will continue to communicate on a clear and timely basis with the South Rosedale Community regarding these matters through postings on its website, email blasts, periodic Newsletters and other communications, as may be warranted. 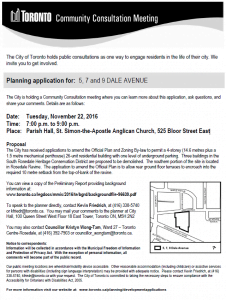 A community consultation meeting regarding the proposed development at 5, 7, 9 Dale Avenue will take place from 7 to 9 PM on November 22 at St. Simon-the-Apostle Church at 525 Bloor St. East. For more information regarding the proposed development, see here. On March 28, 2010, the Committe of Adjustment (the “Committee”) rejected the Application by the owners of 80 Crescent Road for consent to sever the property and to approve 7 minor variances arising from the proposed construction of a house-behind-a-house. Previously, in March 2009, the Ontario Municipal Board (“OMB”) approved an Application to permit the building of a house behind the present dwelling at 80 Crescent Road in a condo­minium arrangement. One reason for this approval was that the City’s “new” Official Plan was silent on the issue of house-behind-a-house, while the “old” zoning by-law prohibited it. The SRRA and several neighbours opposed the Application and disagreed with the decision of the OMB. The owners of 80 Crescent Road subse­quently decided to create a separate lot at the rear of the property. This triggered 7 variances from the zoning by-law that had to be approved by the Committee. Most of the variances were quite extreme; decid­edly not the “minor variances” typically requested at the Committee. Despite the advice of lawyers and civil servants, the SRRA Executive decided, on the basis of previous experience, that the non-minor character of the variances provided a small chance that the Committee would reject the Application. SRRA Director Alex Murray submitted two letters to the Committee, one on the sever­ance and one on the variances. He spoke briefly on the flawed logic of the OMB decision and rejected the assumption that such a gross pack­age of variances had to be accepted “the OMB has spoken”. Mary Lou Flynn-Guglietti, a lawyer who was on our team at the OMB, made a crisp, hard hitting presenta­tion demolishing the Applicant’s lawyer’s defence of the variances as being minor and already approved by the OMB.